Shepherd's Bush Market is a street market in Shepherd's Bush, London. The market is located on the east side of the railway viaduct for the Hammersmith and City Tube line, and is bordered on the north side by the Uxbridge Road, and on the south by the Goldhawk Road. The market sits on land owned by Transport for London and is the subject of a regeneration plan by the London Borough of Hammersmith and Fulham. 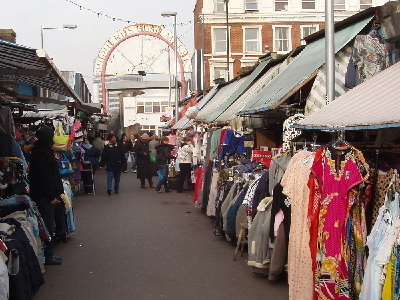 The Market is distinct from New Shepherd's Bush Market, which is a street market similar in character and located a short distance to the west along the Uxbridge Road. 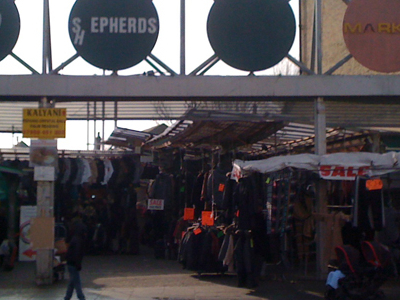 New Shepherd's Bush Market is owned by SBM Enterprise Ltd. The market dates back to the early part of the twentieth century, when the present layout of the Hammersmith and City tube line was fixed. The market opened for business in around 1914, with shops lining the railway viaduct. Individual market vendors sell a wide variety of goods, including fresh produce, cooked food, music CDs, household goods and clothing. Individual vendors rent their stalls from Transport For London, who own the land on which the market sits. The market is open six days a week from 9am - 6pm, and is closed on Sundays. The market is the subject of a regeneration plan by the London Borough of Hammersmith and Fulham. In September 2010 a revised planning and regeneration brief was issued. In February 2011 the Fulham and Hammersmith Chronicle reported that plans included 250 flats, and also rehousing the existing tenants, many of whom objected to the plans. In July 2011 former Mayor of London Ken Livingstone visited the market to add his voice to those opposed to the Council's plans for regeneration of the area. In January 2012 it was reported that a Judicial Review of the Council's plans will take place in May 2012. However, not all the market traders oppose the plans. In February 2012 James Horada, chairman of the Shepherd's Bush Market Tenants Association, said that "The fact that there is a proposal to regenerate the Market is a wonderful thing because we have been trying to encourage this for a long time" although he criticised the £3,000 compensation offered to existing tenants as being "not really enough". Here's the our members favorite photos of "Markets near Hammersmith and Fulham". 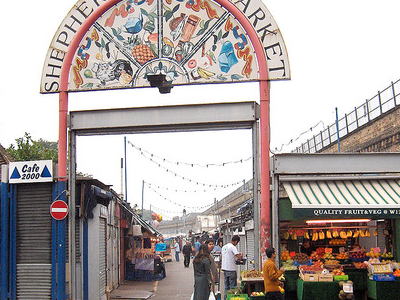 Upload your photo of Shepherd's Bush Market!